When you pull a loose thread from your favorite sweater, it can be difficult to let it go. This human instinct to get to the bottom (or in this case, the end) of a thread can lead it to unravel into a pile of nothingness. 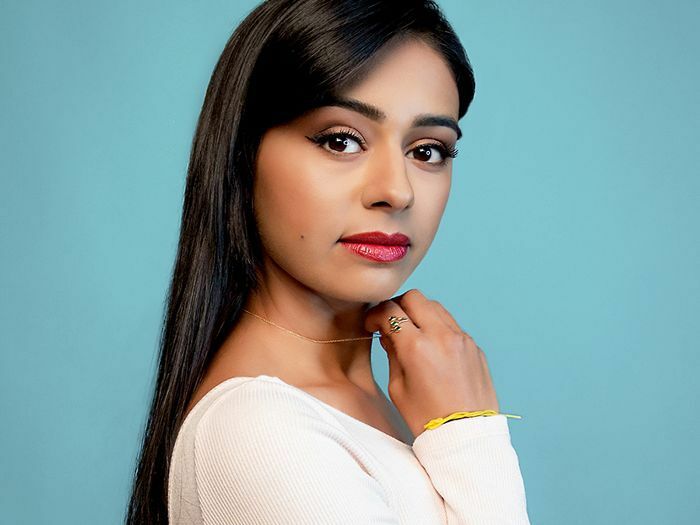 For Nelufar Hedayat, a young, award-winning reporter, her passion for journalism works in the very same way, and the proof is in her latest Fusion TV series, Food Exposed, launching tomorrow. "It all started with this really weird fact that I couldn't get over: 51% of all the harmful emissions on the planet is a result of animal agriculture," she told MyDomaine. "More than all the planes, trains, and cars in the world put together, it's animal agriculture that's harming the planet? That was the thread that I pulled to get to where we are now with this eight-part series." This seemingly banal fact that others might dismiss after giving it no more than a few moments' thought turned into a deep dive in the dark side of the industrial food complex for Hedayat. Not one to sit in a cubicle, the young journalist—who was born in war-torn Afghanistan before moving to London with her parents at age 6—traveled the world, from the North Pole to China, West Africa, and Asia, to uncover the shocking truths behind the food we eat every day. A year later, we're faced with a fascinating eight-part series on the multitudes of issues that plague the global food chain: overconsumption, resistance to antibiotics, superbugs (yes, they are a thing). Trust us, you'll never look at the food you eat the same way again. Hedayat has a natural heightened curiosity and the spirit of adventure in her veins—something she believes comes in great part from her upbringing. "I was born in Afghanistan and landed in London when we had this massive war, so I couldn't help but be caught up in it all," she told MyDomaine. "I wanted to be part of telling the story of what was going on in the world, rather than observing it." The young journalist grew up watching news from various sources—BBC, Al Jazeera, CNN—and though she was exposed to many perspectives, she realized that there were many issues no one was talking about in the Western world. In the past, Hedayat has won awards for documentaries tackling difficult subjects like child brides, the dog meat trade in Vietnam, and illegal traffickers. "Food Exposed could have been a very different show," she adds. "We could have found beautiful studios, found the exact right expert, and forensically analyzed every bit of the food that we were talking about, but that wouldn't have been me. It wouldn't have been informed by how I was brought up or where I am from. It's really hard for me to sit in front of a computer and feel like I'm nailing it. I really just want to get my hands dirty, literally." So she did, by traveling to all parts of the globe—and what she uncovered was astounding. This documentary series is not Hedayat's first rodeo. In the last decade, she has worked for the BBC and Channel 4. She has contributed for The Mirror and The Guardian. Last year, she made headlines for her award-winning docuseries, The Traffickers, on Netflix, in which she uncovered the underground world of illegal trafficking of precious minerals, counterfeit drugs, endangered species, and even people around the globe. "The Traffickers was very difficult to because we were essentially rubbing shoulders with criminals," says Hedayat. "But on Food Exposed, I found it much harder to navigate the world of corporate America—and dealing with corruption on a scale that's breathtaking—than dealing with than any trafficker. Give me an old-fashioned trafficker any day over a multinational and their lawyers." She describes her new series as The Traffickers 2.0. "In the last series, we were dealing with one guy in one town who was doing a dodgy thing. But what was more malign and insidious was the systems that allowed this to happen. Food Exposed is about that. As often as I was shocked to see the blatant disregard and illegality of the things we were discovering, I was even more dumbfounded by the legal things that go on within the industrial food complex that apparently people signed up for." But have we? How much control do we have and how much are we allowed to know? Of all the things she uncovered, Hedayat was most troubled by the season finale, an episode on the pork industry. "We are using medication, pesticides, herbicides, and antibiotics at rates that are dangerous to human health," she told us. "In the pork episode, we find out subtherapeutic uses of antibiotics in farm animals and confined animal feeding operations. Our voracious appetite for cheap meat is going to cause serious problems for our health. And I don't just mean obesity; I mean antibiotic resistance, superbugs, sewage in our water systems." What really struck the journalist was the number of chemicals in the mechanization and industrialization of our food production. "The days of the beautiful red barn with the picket fence, the animals in the backyard, and the vegetables growing are over. Everything is now done on an industrial scale. And if we knew about it, we wouldn't eat it." Luckily, for every corrupt industry—no matter how deep the well of moral turpitude—there is usually a hopeful countermovement. "I found this beautiful, growing subculture of young farmers who want to find a better way and don't want to be part of antibiotic-resistant superbugs that are growing inside these confined animal feeding operations where a lot of our meat comes from," says Hedayat. "In a way, this entire series showed me that we are interconnected in ways we can't possibly imagine. And all it takes is people at all levels, from producer to plate, to just care a little bit more, be more transparent, and accept responsibility to cause the most amazing change. I was really heartened by what I saw in this counterculture that's brewing." Hedayat might have uncovered incredible levels of immorality in our legal system. "That's the dark side of the food business," she told us. "You can truly, blatantly see laws, politicians, and governments bending that robust arm of ethics and morals to suit the needs of corporations and the industrial food complex. But we have our own part in it as well: I was shocked by the scale of our culpability as consumers. It's astounding how much we are all complicit without being given the correct and accurate information." But hope is not lost. For Hedayat, it's up to us, the consumers, to truly enact change: "I was most inspired and heartened by the realization that we all collectively have the power," says Hedayat. "We are the 99.99% of the solution because whether it's the scandal of horse meat in the UK or whether it's food that's covered in pesticides and herbicides in the U.S., when consumers demand change, change happens." Her advice to anyone who watches the series and feels like they want to do something is to Google it. "Don't believe what you are told"—this is her biggest takeaway. "No one is willingly going to tell you the hard truth." Instead, she recommends that people find their own way to enact change: "Whether we start demanding that regulations are changed or we vote in the right legislation and the right people making these policies, it's all in our hands. Find the group that speaks to you, whether it's dealing with the food-waste problem or water preservation, and participate. Be part of the solution. It's really as simple as any of the meals we eat on any given day."